Today is the first episode of my Spring Cleaning series and we are starting small with the front hall closet. In my usual forgetfulness I didn't take a before picture but if I'm being honest the before and after wasn't too different. I mostly just wanted to wipe down the shelf and vacuum the floor. There wasn't a whole lot that needed to be decluttered. 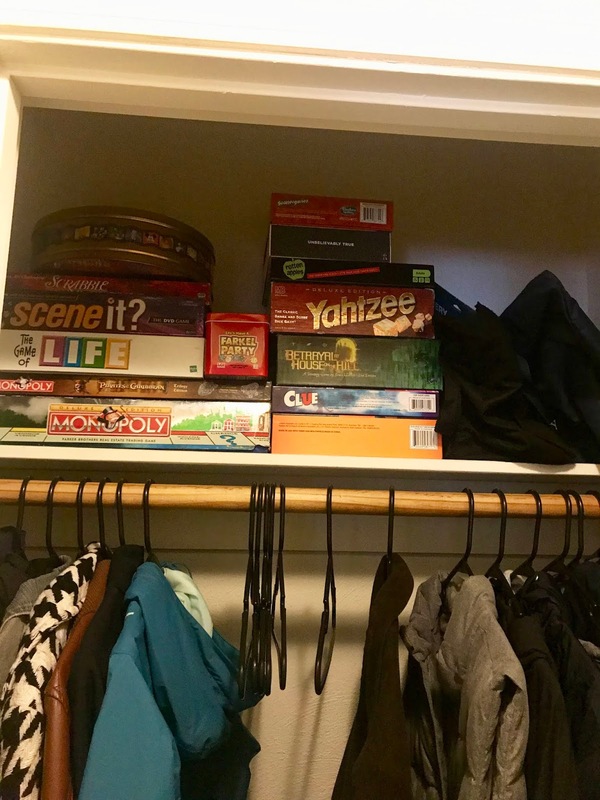 In this closet we keep our coats, board games, some shoes, and a few other random items. The first thing I did was pull everything out of the closet and pile it in the kitchen. Then I wiped down the shelf and used my vacuum to clean the floor. 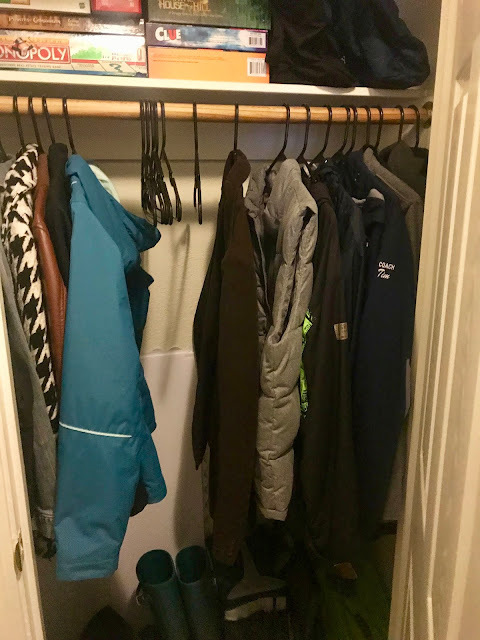 As I put things back I tired to keep my coats on one side and Tim's coats on the other. I'm sure we have more coats then we really need but I truly wear all the coats from my side and Tim's stuff is his responsibility to declutter. On the top shelf I stacked up our games and found a spot for my dance bags. I'm not sure why I insist on keeping all my dance stuff ready to go, but I like to have it here. The second bag is for my dance team stuff so that is necessary to bring when I coach. 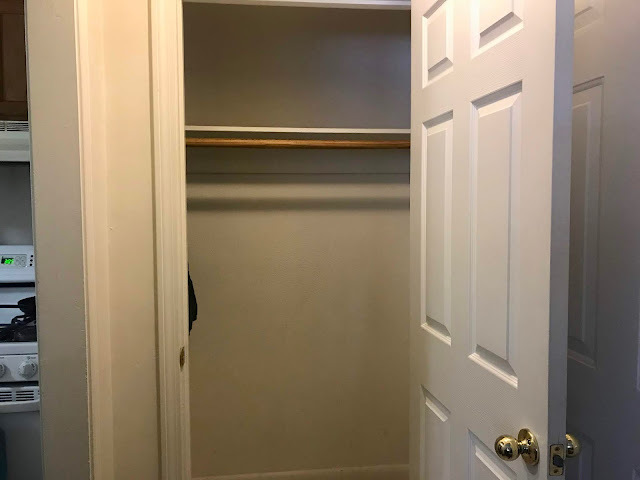 I keep a few extra hangers available in case we have guests who want to hang up their coats in the closet. I despise our floors, they are so gross looking. I can't wait to buy a house and chose my own floors at some point! On the floor I kept my rainboots, my uggs, Tim's boots, Tim's lunchbox, a shovel, car cleaning supplies and my step stool. In the back I also have a poster with a picture of me from Halloween when I was little and the poster from my bridal shower. To the right side there are also a few golf clubs and a golf umbrella. Overall the only thing that didn't put back in here was a gaming chair that Tim has never used but it definitely gave us a little more room. Now for the exciting news, I am hosting a giveaway!! 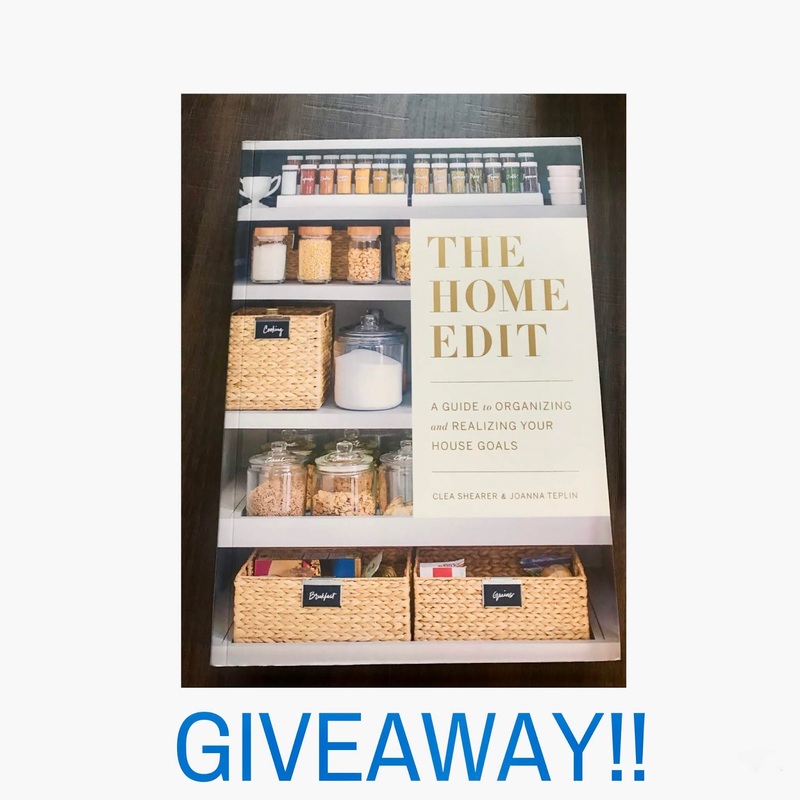 If you haven't heard, The Home Edit just released their first book and let me tell you it's incredible! The pictures are gorgeous and their method for organizing and making things look beautiful is perfect. I adore their Instagram (thehomeedit) and want to share the inspiration with all of you so in addition to buying a book for myself, I picked one up to share with one of you! In order to enter the giveaway you can head HERE. This giveaway will be open until April 3rd at 11:59PM and I will announce the winner here shortly after. This giveaway is only open to those located in the United States. Good luck! In addition to this post I also filmed a front hall closet clean with me video which you can check out here. 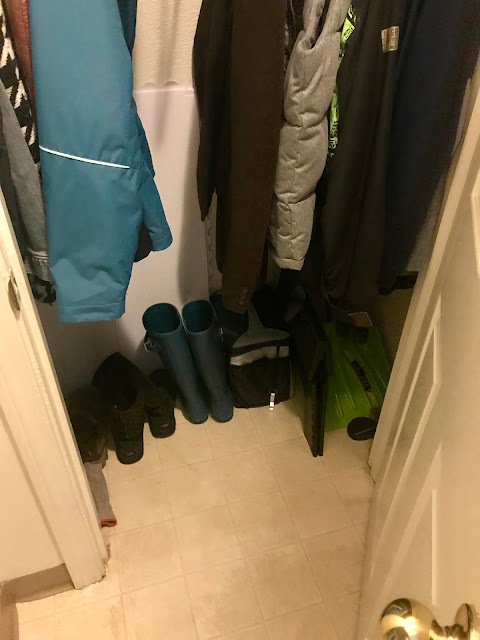 I share a closet with my husband and I want to organize it. He has a lot of shirts and I have way too much clothes. I need serious organizing and decluttering.